Juno, the New York ride-hail company that promised to treat drivers well, is seeking a buyer. The company has been circulating a short pitch deck headlined “Unique opportunity to consolidate NYC market.” The document, which was reviewed by Quartz, describes Juno as the number-three player in the New York City ride-hail market, with 14 million rides in 2018. It says Juno had a run rate of $270 million in sales and about $40 million in commissions from those sales as of January, though it doesn’t specify the period of the run rate. Crain’s previously reported Juno was losing $1 million a day and for sale at a nominal price, citing a person familiar with the matter. It’s unclear what a buyer would gain from Juno other than its list of riders and drivers, many of whom also use competing ride-hail apps like Uber and Lyft. Juno didn’t respond to requests for comment. Juno claims it has been hurt by legislation to raise driver wages passed by New York City this past December and implemented by the local taxi regulator on Feb. 1. The pay rules put in place by the taxi commission are based on a so-called utilization rate and require ride-hail companies to pay drivers at least $17.22 an hour after expenses. Juno and Lyft each sued the city over the pay rules and underlying utilization formula on Jan. 30. 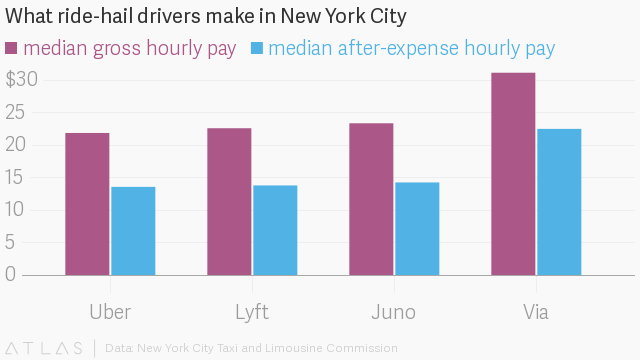 Juno CEO Ronen Ben-David said in an affidavit filed March 12 in New York State Supreme Court that Juno had “incurred significant increased costs” to comply with the city’s pay rules, but that both ridership and average hourly pay to drivers had declined. He said ridership had fallen 30% in February compared to January, while average hourly driver earnings were down 17% from the previous month. In a separate affidavit also filed March 12, Lyft general manager for New York and New Jersey Ann Ferracane said Lyft raised ride prices to comply with the new pay rates and had since seen a “significant decrease” in the frequency of passengers requesting rides and total rides in the market. Ferracane previously estimated it would cost Lyft an additional $2.3 to $2.5 million per week to comply with the taxi commission rules, depending how they were implemented. At least one company is benefiting from the new pay rules. Via, the smallest ride-hail company in the city that the rules apply to, said weekly completed rides are up 15% since Feb. 1. Via primarily offers shared rides, unlike its competitors, and has been largely unaffected by the city’s rules because it already paid its drivers more than $17.22 an hour. Juno was founded by Talmon Marco, an Israeli-American entrepreneur known for creating copies of hot internet companies and flipping them for a profit. His biggest success to date was Viber, a call and messaging app similar to Skype that sold to Japanese e-commerce giant Rakuten for $900 million in February 2014. Juno sold to competitor Gett in April 2017 for about $200 million. Gett, an Israeli ride-hail company, predated Juno in New York City but struggled to gain the recognition that Juno achieved fairly fast. After the acquisition, Gett moved its New York operations under the Juno brand but continued to operate as Gett in its other markets—Israel, Russia, and the UK. It raised $80 million in venture funding in a deal led by Volkswagen in June 2018, at a valuation of about $1.4 billion.